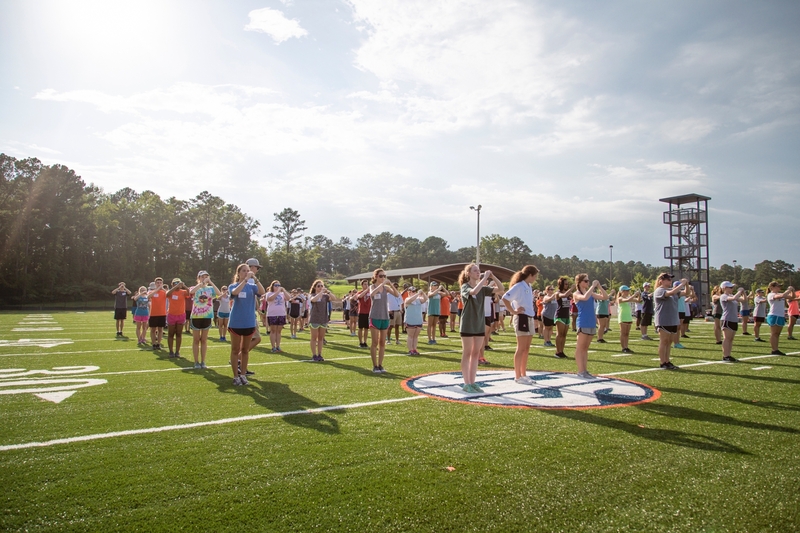 Welcome to the 2019 Preseason Camp page, your source for information on the preseason band camp for the Auburn University Marching Band. This page will be updated periodically throughout the year with details on our 2019 camp, so keep an eye on the site for the latest news. Also, feel free to check out our Frequently Asked Questions for more details about preseason camp and the AUMB. The starting date for Preseason Camp varies for different sections of the band. Specific check-in times and schedules will be made available as the camp approaches. First year woodwinds and brass register for Preseason camp. New woodwind and brass music evaluations occur; marching fundamental instruction begins. Marching evaluations for all woodwinds and brass; Final roster selected. Preseason camp continues through August 18. New or Returning (opt.) participant move-in Sunday, August 4. Returning participant move-in Thursday, August 8. AUH will host early move-ins on Sunday, August 4 and Thursday, August 8. NEW participants (opt. RETURNING participants) must move-in on Sunday, August 4. Returning members have the option to move-in on Sunday, August 4 or Thursday, August 8 prior to VET registration. AUH Move-In Registration will open May 15 and run through August 1 in the Housing Student Portal. When you register for a move-in time, please select "Band" as the organization requiring early move-in. You must register for a move-in day to have your room, key, and documents prepared when you arrive. Residents will be able to view their assigned move-in time beginning July 8 under their assignment in the student portal. If you need to change your move-in time or date after you have registered, please send an email with your request to housing@auburn.edu with the subject line "Band move-in time request." RETURNING Participants: If you choose to move-in on Thursday, August 8 and you are assigned a move-in time later than 12:00 pm, please send an email with the subject "Band move-in time request" to housing@auburn.edu requesting another afternoon time that doesn't conflict with the AUMB preseason rehearsal schedule. Any prospective member who completes an AUMB intent form after August 1st will need to send an email to housing@auburn.edu to request a move-in time. Pre-game and Halftime show music will be available in the AUMB Member Database sometime in June.